The week between Christmas and New Year’s, I jetted down to Atlanta for a couple of days to catch up with my family. We have a small but very complicated family, and given that my mother moved away from Atlanta a month after I moved north to Virginia, I don’t get to see anyone very often–and when I do, it’s never for long, so I try to make the most of it. 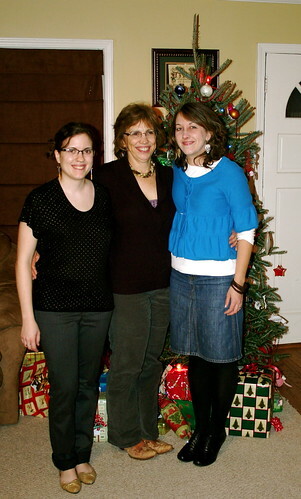 This year I proposed a girls’ night out for me, my mother, and F, my sister-in-law. I mean, who doesn’t love a chance to dress up a little and hit the town? Unfortunately, I’d IKEAed it earlier in the day, and driving from the ‘burbs to IKEA, surviving the store, and driving back to the ‘burbs did me in. No intown Atlanta adventures awaited us. But, thankfully, right where my brother and F live is in the new Little Asia of sorts. So we decided to try out a Japanese restaurant rumored to have excellent ramen, and then hit the Super H Mart afterward to pick up some goodies. There’s a back story to the restaurant choice, of course. As soon as I heard the McSweeney’s would be producing Lucky Peach, I subscribed. And the first issue coincided perfectly with our beach trip. Beach reading! The first issue ended up being dedicated entirely to the subject of ramen–all the complex yet simple noodley, soupy goodness that it is. 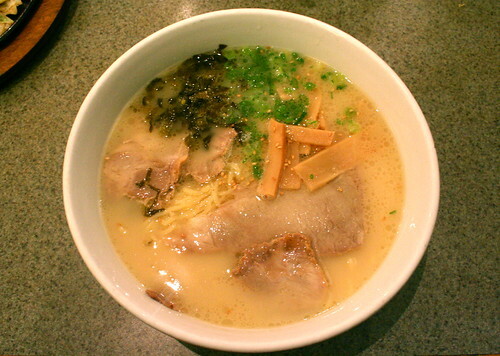 Having never been able to even try a bowl of ramen in my lifetime, I became obsessed. And, since July, have consistently failed at getting a bowl of it. Thus, in the suburbs filled with Korean-Japanese-Vietnamese-etc. restaurants, I knew this was it: this was my chance to finally satisfy a six month old craving. Haru Ichiban, tucked in a strip mall that I used to frequent for the jalapeno queso of El Torero in my middle school days, is a little slice of Japanese cuisine heaven. It’s been around for awhile and came recommended by Creative Loafing, so I knew it would hold some potential, but had no idea how much. We started with a few small dishes to share–pork gyoza, a vegetable roll, and vegetable tempura–and then each ordered a bowl of ramen–tonkotsu. And it was waaaay too much food, but isn’t that what nights out are for? The vegetable tempura was nothing special in the preparation, but the array of vegetables really blew my mind. Pieces of potato, yellow squash, pumpkin (I think? 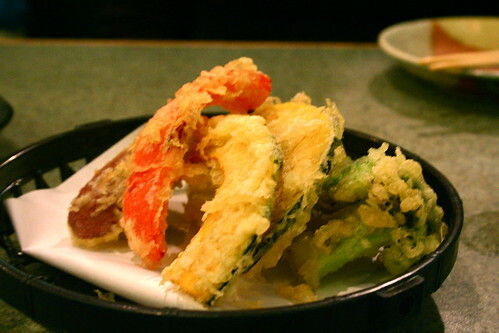 ), even broccoli were lightly fried in tempura batter and served with a dipping sauce (soy-based, I’d guess). Who knew tempura broccoli could be so good? The broccoli was steamed and then fried, giving it a definite crunch with the tempura, but then a soft, pillowy bite on the inside. Yes, pillowy broccoli. Seriously the best. 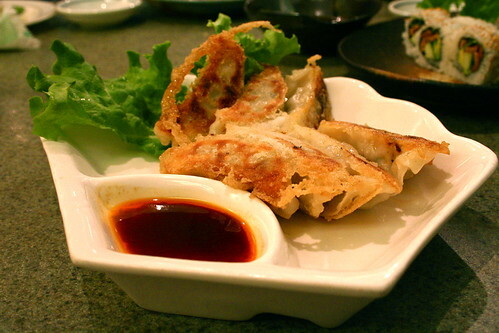 A favorite of my mom & F’s was the pork gyoza–dumplings filled with pork and seasoning, steamed and then fried and served with some sort of sauce. The dumplings were salty and savory and slightly oniony all in a good, soft & fried way. They weren’t anything special, but they were utterly delicious. I had to fight to get one of them from the other ladies! And, since neither my mom nor F enjoy sushi, we compromised (since I’m addicted to it and love trying it in new places) and ordered a vegetable roll chock full of avocado, cucumber, carrots, and lettuce. The vegetables were so incredibly fresh and snappy that I think this might take the title of best vegetable sushi I’ve ever had. I would have loved to see what the sushi chefs could create with fish, but I’ll save it for some other time and have a smorgasbord. But we weren’t there for the small plates–we were there for the ramen and, let me tell you, it delivered. All the prep reading of Lucky Peach prepared me for tonkotsu ramen to be milky, porky, and noddly, and it was. My heavens, it was. And the bowl was bigger than the size of my head. So we really could have almost just shared one between us all. The noodles were soft and slurpable, but still with enough solidity to make them satisfying, and the broth was unbelievably milky and just salty enough. I could have gone for more pork, but with the broth I can’t really complain, and the bowl, though only half eaten, was well worth the 7 hour drive to Atlanta from Roanoke. I wasn’t sure if F & my mom would like or enjoy the meal, but they really seemed to, and I even talked them into sharing some cold sake (Gekkeikan Draft) with me! Points! What might have been a stretch ended up being a comfortable evening catching up with each other, sharing a ton of laughs, and enjoying dishes we’d never tried before. If you’re looking for a great Japanese restaurant with amazing ramen and reportedly delicious sushi, definitely check out Haru Ichiban. It’s well worth the drive from downtown (plus you can feel super superior to the overweight suburbanites waddling out of the Melting Pot–a kitschy fondue restaurant–next door. What more could you ask for?!). I’m not really a sushi fan, but some of that looks good. Glad you had a good time with your friend- I need a guys night! The sushi looks so yummy! I just posted a review of my new favorite find – Bushido. It’s a fantastic Japanese place and every time I think about going back there next weekend, I think I drool a little. Your description of the broth is making me swoon. I am a broth lover to the max. When I make soups and stews, I end up slurping up all the broth and having to remember to at least eat some of the mix ins. Everything looks delicious! This post brought back a fond memory I have of battered and fried cheesy broccoli at a bar called “Joe’s” in Champaign, IL (college days). Ok it’s probably no match to this tempura but isnt fried broccoli the best? Also, girls night out rules, especially with familia. Sounds like a super fun time out! 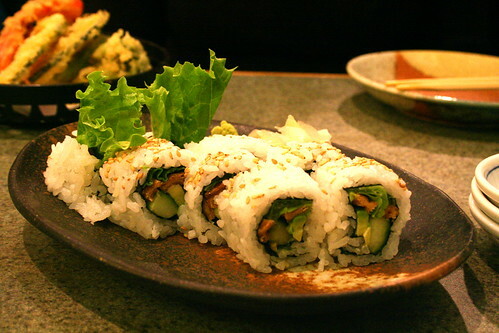 Love good vegetable sushi! Ooh I love tempura broccoli and pumpkin, but most places seem to stick to eggplant, sweet potato, and peppers. I need to head up there! Now I want tempura! That looks like kabocha squash to me, and it just so happens that I have a kabocha sitting on my counter right now…MUAHAHA etc. I think the huge veg rolls with everything are my favorite sushi ever. When we lived in Brooklyn, I’d always get our local sushi place’s jade roll: seaweed salad, asparagus, avocado, & cucumber. SO exciting.